With a crucial federal election looming, it is important that Canadians find a way to redeem the federal government after Stephen Harper’s nine-year train wreck. Harper’s neo-cons cheated and lied to take over the Progressive Conservatives and devolve it into the Conservative Party of Canada (see Anthony Hall’s article Conservative Party crashers in this edition, and Neconning the Public in our May edition). They went on to cheat in the last three elections – robo calls, campaign over-spending, withholding information on the purchase of F-35 fighter jets, denying climate change, closing down scientific research, dragging Canada into war, and now using our tax dollars to bribe us with child tax credit. It doesn’t stop there. They gerrymandered electoral boundaries, installed 30 new ridings, and renamed 31 others to further confuse people. With such tactics their intent is obvious: keep power no matter what. Harper’s dictatorial control is double-speak in the form of the Fair Elections Act. It will be as fair as its big corporate supporters south of the border – who want to keep control of Canada’s resources, export our wealth, while ignoring our civil liberties and environment. We cannot allow this Conservative carnage to continue. The actions of Brigette DePape, who held up a STOP HARPER sign in he House of Commons, have proven prophetic. Harper’s list of damage is long. We need a new government that will protect Canadian values. We need leaders who have the strength of conviction to save Canada. So with that in mind we introduce the leader of the Official Opposition, Tom Mulcair. What impresses most is what he has done, not just what he has said – in particular, his commitment to protect the environment when he was the environment minister in Quebec. When he stood up to Premier Charest to protect a park from condo development, it cost him his cabinet privilege. He sat as a back-bencher to fulfill his term, then quit the Quebec Liberals. Later he was invited to join the NDP. But by caring deeply and doing what was fair, legal, and in the best interest of the public he protected the commons from privatization. This selection, chosen from his new book released August 2015 tells that story, and why he deserves to be the new Prime Minister. The storm clouds are gathering. Harper has done his darnest to fix the game in his favour. 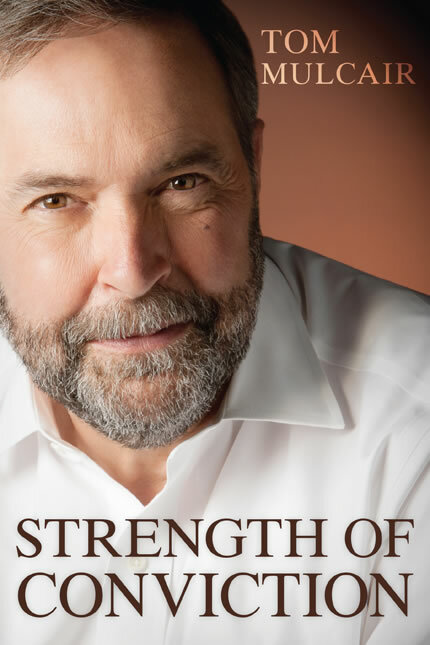 His operatives have attacked Justin Trudeau, Elizabeth May and now they will turn their propaganda machine on Mulcair. It is now up to each of us to see through their fog of election war, to learn from recent history, to be clear about principles, to participate in our own riding campaigns and support candidates who are best able to change the government of Canada for the better. Our actions and decision today will effect generations to come. Get involved, learn from history, and vote. 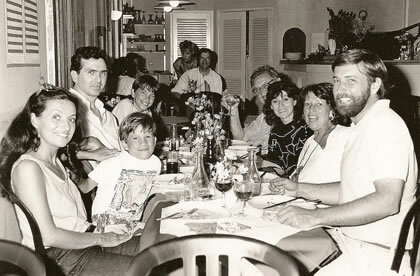 A younger Thomas Mulcair with wife Catherine Pinhas (left) and family members in Paris. Photo © the Mulcair family, used with permission. In 2005 we learned of an illegal development in western Laval, where a developer had gone ahead and developed a large tract of land including clearly protected areas. Instead of fining the developer after the fact, as the department had always done and which we knew would have little effect, I decided that it was time to send a strong signal that this was no longer how things would be done. I consulted our legal team. Did we have a more stringent approach available to us? Our lawyers said we did, but it had never been tried before: I could issue an order forcing the developer to restore the wetland to its original pristine state. So that’s what we did. I issued the order in August 2005. I had just completed a wide-ranging twenty-one-city tour of public con­sultations on my draft Sustainable Development Act, starting in Kuujjuaq on Ungava Bay in February and criss-crossing the province right into April, with Alain Gaul, my chief of staff, occasionally along to provide guidance, and Chantale Turgeon, my press secretary, as my wagon master. To oversee the whole operation, Alain had tapped Isabelle Perras, a very respected, experienced hand, whose wisdom and determination inspired the entire team. Everything was going well, and the legislation was ready to go, when a Cabinet meeting was called in August. The order to restore the wetlands in Laval had just been issued and had received very favourable front page coverage, with a piece by Louis-Gilles Francoeur, the highly respected environmental reporter for Le Devoir. He has since gone on to sit as vice-president of the Bureau d’audiences publiques sur l’environnement (BAPE), the independent public environmental review board charged with assessing development projects in the province. It was the first time that Premier Charest and I had a disagreement, and it came as quite a surprise. He clearly wasn’t pleased and told me so in no uncertain terms. I remember asking him if he was telling me that I should apply the rules one way in Longueuil and another in Laval. It was a bolt from the blue. After all, hadn’t Charest himself been minister of the environment in the federal government? When I got back to the office I was still winded. I sat down with Alain and went over the day’s events. I was going to stick to my guns. From then on, in contrast to the first two and half years of my mandate, relations became frosty between the premier and me. There were several more disagreements, one of them over the Coca-Cola corporation. Since the 1980s Québec had had a law on the books on recycling soft drink cans that, to make things simpler, was also applied by the companies to juices. One day Coke decided that it was no longer going to charge the five-cent deposit on the juice cans, which meant that they could no longer be recycled as part of the deposit and return system. When François Cardinal, the environmental reporter for La Presse who has since joined the paper’s editorial board, asked me what I was going to do about it, I said I wasn’t going to allow it. That didn’t sit well with the premier. Our next serious disagreement came in the fall of 2005, over the Rabaska project — a methane and liquid natural gas plant and meth­ane terminal that was being planned for the port of Lévis, across the St. Lawrence from Québec City, by a private consortium including Enbridge, Gaz Métro, and Gaz de France. Local environmental and citizens’ groups vehemently opposed it. In early 2006 I decided to go down to Boston and have a look at the Everett deliquification plant situated there. The plant was close to a bridge that was very reminiscent of the Jacques Cartier Bridge in Montréal. As with the proposal for Lévis, the liquid natural gas came into port in massive tankers. I met with U.S. officials, including the senior level of the U.S. Coast Guard, who turned out to be very helpful and truly exceptional people, to ask them how safe those installations were. I described to them the Rabaska project that was being planned on the St. Lawrence, right across from Québec City, a metropolitan area numbering close to a million people. They warned that it was extremely dangerous and should never be allowed, which only confirmed my own and my depart­ment’s evaluation. I went home to Québec more determined than ever to block the project. While all this was going on, an even more contentious matter that had been simmering for a more than a year was about to come to a boil. Mont-Orford provincial park, established in 1938, covers nearly sixty square kilometres of lakes, rivers, mountains, and valleys, featuring great downhill and cross-country skiing. As the Mont-Orford ski hill was losing money and there were fears for its financial viability, the premier and several of his ministers had negotiated a deal to sell 649 hectares of parkland surrounding the ski hill to private developers. The provincial government was proposing to sell off a significant swath of public land that had been set aside in perpetuity for future generations. Mont-Orford was in the premier’s electoral backyard. He went on record supporting the deal and made it clear he wanted the project approved as soon as possible. I was also under considerable pressure from colleagues who urged me to deliver for “the team.” At the end of the day, though, I was being asked to sign a document selling off public land in a provincial park to private developers. We had a clear legal opinion that as long as the land could still be used for a park, selling it off was illegal. I simply couldn’t do it. It was a matter of principle. I refused. In politics we’d better stand for something, because we’re often faced with decisions that force us to weigh private interests against the public interest. You need strong convictions. Conviction is what gives you strength to fight the battles that must be fought, to do the job the voters sent you to do, which is to faithfully convey, protect, and defend their interests. We are elected to represent them, to be their voice in our parliaments, in our governments, in Cabinet, as the case may be, and to influence government decisions on their behalf. They place their trust in us and we must never forget why they elect us.